The hotel is situated in a nature reserve in the municipality of Gaiole in Chianti and is distinguished by the charm of this landscape. 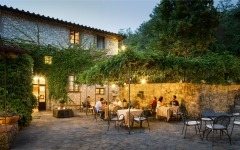 Located in an old mill, the 4 star hotel has all comforts including a restaurant and an outdoor pool. The Hotel Ultimo Mulino is the perfect destination to spend vacation in an oasis of tranquility, ideal base for excursions and guided tours of the main attractions of Chianti. L'Ultimo Mulino is ideal hotel for those who want to celebrate wedding or any ceremony in the beautiful surroundings of the Chianti.